A group of 35 professional investment managers with more than $3 trillion of assets under management sent a letter to House and Senate leaders Feb. 25 urging them to ensure passage of legislation necessary to spur clean energy resource development and make a transition to a low-carbon society. In the letter the broad-based group, which includes pensions funds such as the California Public Employees’ Retirement System (CalPERS) as well as institutional investment managers such as Deutsche Asset Management, called for adopting national renewable power and fuel standards, a national climate policy that includes nationwide greenhouse gas emissions reduction targets and transportation policies to reduce use of petroleum, carbon dioxide and GHG emissions. Coordinated by Ceres and its Investor Network on Climate Risk, in the letter the group also urges Congress to develop and enact a National Energy Efficiency Resource Standard. Improving energy efficiency and conservation offer the fastest and surest means of significantly reducing greenhouse gas emissions and improving businesses’ bottom lines, the letter stated. Establishing a national energy efficiency standard could yield savings for utilities’ customers of up to $144 billion by 2020, according to American Council for an Energy Efficient Economy estimates. “Energy efficiency is the cheapest form of power we can produce and it is time for national policy to step in and tell electric utility companies that they need to shift their business practices to deliver a lot more of it,” states the letter. Furthermore, regulators acting through markets need to send industry and society the message that emitting greenhouse gases carries a societal cost, one expressed in simple dollars and cents, according to the letter. “National climate legislation acting in harmony with the market will facilitate greater investment in clean technologies and other climate change solutions and will enable the U.S. to not only compete globally, but to lead,” the letter states. Enacting a low-carbon fuels standard and supporting expansion of public transportation systems and adopting maximum performance-based fuel efficiency standards would stimulate the development of new technologies, adoption of a broader range of cleaner transportation fuels thus contributing to economic growth and development, reducing GHG emissions and moving towards a low-carbon society, the group asserts. “We are convinced that building our nation’s low-carbon energy infrastructure is an important part of the solution to our current economic crisis. Delaying action on these policies will deny U.S. families and businesses access to low-cost clean power, reduce our nation’s energy security, and require more stringent, costly solutions to address climate change in the future,” states the letter. The investor group’s recommendations are right in sync with legislation President Obama and other Congressional leaders have proposed and are working to move through Congress. For instance, Congressman Edward Markey (D-Mass. ), chairman of the House Select Committee for Energy Independence and Global Warming introduced a national RES (Renewable Electricity Standard) bill in Congress. Twenty-nine states have already enacted their own versions. Rep. Chris Van Hollen (D-Md.) yesterday said he will introduce a bill to establish a cap-and-trade emissions system that would distribute 90% of the money raised by selling emissions permits to ever person with a Social Security Number. Similarly, Pres. 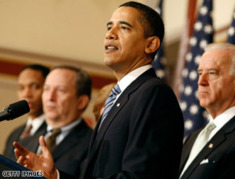 Obama’s ‘American Recovery and Reinvestment Act’ includes establishing energy efficiency and conservation standards for all federal buildings and properties. “The policies outlined in the letter would allow us to invest our clients’ assets with appropriate cognizance of the continuing risks – – and exciting opportunities — that will result from physical, regulatory and technological change spurred by a changing climate and the policy response,” said Alex Popplewell, global co-head of responsible investment at BlackRock, which manages $1.3 trillion in assets.